This looked shut when I walked past recently - all the windows were shuttered and a large "to let" sign on the front of the building. Paid a lunchtime visit to this corner pub during a stroll around Queens Crescent. 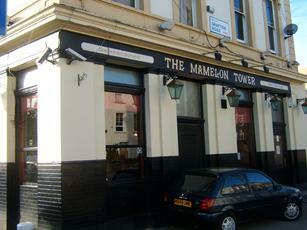 Visitors to the Mamelon will be greeted with a spacious interior and a snug containing a pool table. I had a fairly drinkable half-pint of John Smiths keg beer, noting that real ale is not kept here as there is not a market for it. There remains a full range of lagers, spirits and soft drinks. Live gigs are hosted each Saturday, and at other times a jukebox and TV provide entertainment. I noted the existence of a frail upright piano and was advised sadly that it has been out of use for many years! Parties are catered for, but food is not normally served at other times. Strictly no children, and dogs are not admitted at any time.